Orpingtons have a gentle docile disposition and Temperament. They are easily tamed and are even somewhat affectionate toward their handlers. Orpington hens go broody often and make excellent mothers. Orpingtons tolerate cold temperatures well, but the comb of the male is prone to frostbite and must be protected. Orpingtons forage well on pasture and also tolerate confinement well. Orpingtons are a dual-purpose breed. 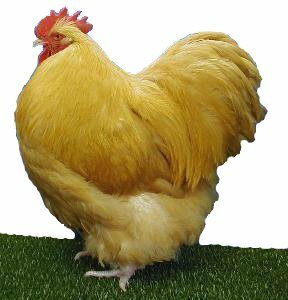 They are known for their calm temperament, good egg laying, and exceptional meat. Hens are good winter layers and lay light to dark brown eggs. Colours: Blue, Black, Buff, White (Standardised UK) Birchen, Chocolate (Bantam only), Cuckoo, Gold Laced, Jubilee, Lavender, Lemon Cuckoo, Partridge, Red, Spangled (Non Standardised).